1) Please provide a short excerpt of what your children’s book is about. The Bezert is a unique, imaginative and poetic parable about the value of trust. The main character, Bezert, has never left the safety and comfort of his island home. But when a box magically appears below his window, it proves too tempting not to take a look. By entering the box, the Bezert begins a journey of self-discovery in a dreamlike world of unknowns and mysterious inhabitants. Ultimately expanding the view of himself, his world and learning the value of trusting himself. 2) What inspired you to write this book? I was working as a freelance editorial illustrator when I created this book many years ago. 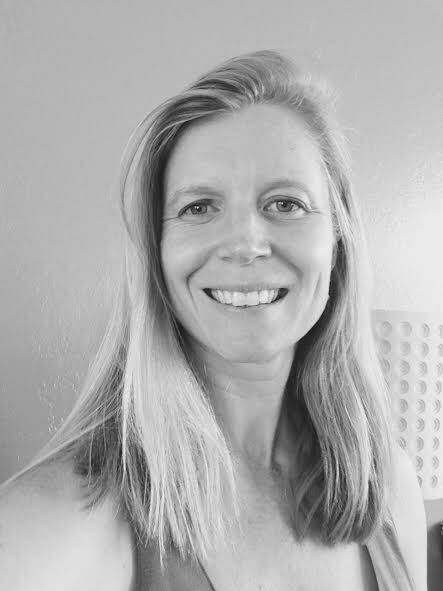 At the time I also had just begun studying Ayurveda, a timeless healing philosophy and sister science to Yoga. This book was inspired by a combination of other books I was reading at the time based on universal truths. I first created 8-10 illustrations based on these concepts, spread them on the floor of my studio and sat down to write about each one of them. The end result was the outline and origin of The Bezert. 3) Why did you pick this genre? 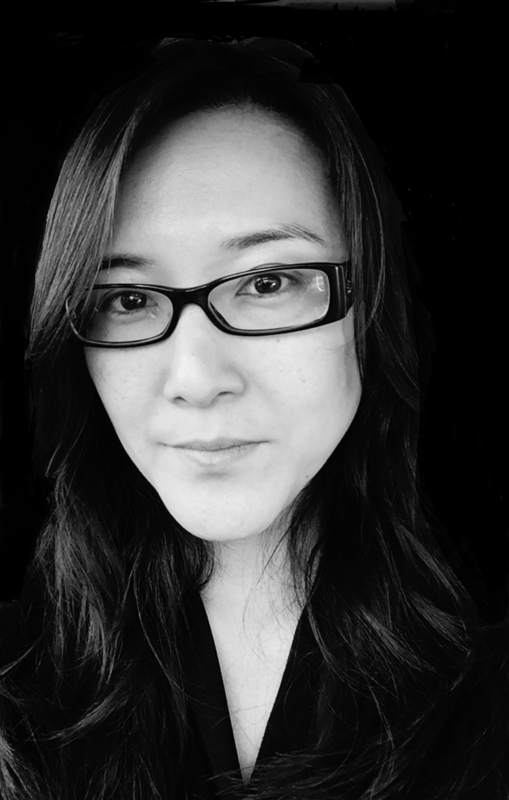 How did you come to be a children’s picture book author? I have always considered myself to be a ‘conceptual communicator’. In other words, I love to take words, stories or verses and bring them to life in a visual way. This book is the result of the interplay between my own writings and my own visual interpretations. I really decided I wanted to be ‘an artist” when I was about 4 or 5 years old so that has been a pretty solid path for me, but although I have always enjoyed writing, I never really considered myself to be ‘a writer’. Now in hindsight, the combination seems perfectly appropriate! I also consider this book to be appropriate for “kids of all ages”. Although it appears to be for children, adults sometimes need colorful illustrations and poetic verse to help tap into their creative side as well. 4) Tell us about the illustrations. What is your style and how did the artwork come to be? What inspired you? I have always been drawn to a mixed media type style. Collage was my medium of choice in art school and the more I worked, my style morphed into a collage/mixed media combination. I like to use as many tools as I can get my hands on. It keeps things fresh and interesting for me and I doubt that will ever change. Most of my work is still done by hand because it wouldn’t feel right if I couldn’t get my hands dirty and work with paint and pencils, but I also enjoy the polish of digital media and the ease of integrating pictures and images into hand rendered work. 5) As a child, what books and/or authors influenced you the most and why? I have always loved C.S. Lewis/Alice in Wonderland, Roald Dahl/Charlie and the Chocolate Factory, L. Frank Baum/Wizard of Oz and especially everything by Madeline L’Engle. A Wrinkle In Time is one of my all time favorites! All of these books opened up my world and conjured a certain special magical quality within me. It is what has inspired me and has helped me to create a healthy creative process. 6) Tell us about your audio book campaign for The Bezert. 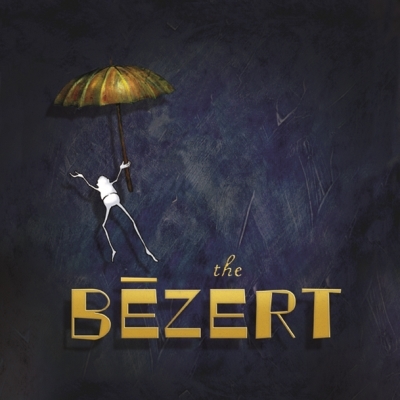 As of October 21st, 2015 we have officially released the audio book version of The Bezert! It has been a long road to get here as we started work on the audio book shortly after The Bezert was published one full year ago. I had no trouble finding a brilliant narrator almost immediately. He was an artist ‘friend of a friend’ from Santa Barbara with the perfect voice, great character skills and a strong desire to narrate a book. We began work in the studio shortly before I learned that my publisher was going out of business and needed to close their doors. Needless to say, I then ran into some challenges with the many other extra financial expenses necessary to keep The Bezert promotion alive. After just coming off of winning 2 indie book awards in NY, and a fantastic book tour event in CA, I realized I was tapped out and needed to start an Indiegogo campaign in order to raise enough funds to complete the Audio Book project. I humbly asked 30 friends and supporters to play small roles in a video I produced and we pulled together a fabulous campaign earning over 60% of the necessary funds to complete the project and finalize the music & studio contracts. Through this process I wholeheartedly learned the importance of support, collaboration and trust. 7) What is the most fulfilling thing about being an author? I really love the opportunity to go to schools and read to classrooms. Each experience is unique but always inspiring. I have yet to come home without being artfully challenged in some way by the kids, their fabulous questions and their insightful comments. I also have really enjoyed each of the different creative events we have put together to bring The Bezert further in to the public eye. We have had dramatic readings by kids wearing masks, circus type events with actors miming along with the audio version, social media campaigns with people taking pictures of Bezert all over the world, and someday I’d love to create an interactive art experience where people can walk through an installation of the book and be fully immersed in the sensory experience through sight, sound, scent and touch. 8) What do you hope children will take away with them after reading your book/s? I hope this book inspires children (and adults) to dig deep into their own creativity. I hope it challenges them emotionally and gets them to think about concepts bigger than themselves. I also hope it gives them the reassurance that they too can write their own story and share it with the world in their own special way. And in the end maybe they will learn to trust just a little more, in both themselves and the greater world. 9) What advice do you have for aspiring author and illustrators on how to navigate this world of publishing? Although it is a nine month process in itself, the actual act of publishing a book is just a very small part of the picture. The bigger job comes when you need to tirelessly promote yourself and your book at every given opportunity for as long as you possibly can. The thing I have found to be helpful is to use as much creativity as you can when you do this. To try not to seek out the way that your book fits in, but rather find out how it stands apart from the rest and market yourself from that platform. If it is a book filled with flowers, market to unique gift stores and garden shops, if it is about animals, find creative ways to talk to businesses who work with animals, humane society events, farms etc. In a bookstore you are just one book among thousands, but standing alone you can get much more positive attention and help build awareness in the process. And then never, never give up. Make the book your passion. Embrace it and intuitively follow every possible opportunity that presents itself. 10) What are you working on now? I always have a few irons in the fire, but my main project after nearly a year of promoting The Bezert, is getting back in the studio and illustrating a second book in this series. Many years ago when I wrote The Bezert, I also penned a sequel. My next project is to illustrate and publish the second part of Bezert’s journey. As I said at the end of the first book…”Not The End” now I need to follow through on that promise. THANK YOU FOR LETTING US GETTING TO KNOW YOU! Should you wish to know more about Maria Knier and would like to purchase her book, here are all her pertinent details. Georgie and the Ants in the Pants encourages children to embrace their individuality, silliness, and excitement – otherwise known as the “ANTS” in their pants! My book promotes dancing, laughing, and acting silly! The ultimate message of my book is to inspire children to believe in themselves! A few years ago I started Ants in the Pants, which originally was just a children’s clothing line that I created. I stopped making the clothes because it became too challenging. When my niece Sloane was born a few years later, she changed everything. She sparked me with inspiration that I never felt before! I wanted to create something to encourage her (and every child out there!) to believe in themselves. I started making the clothes again, and then the idea for Georgie and the Ants in the Pants came to me. The fact that wanted to be a good role model for Sloane was the force I needed to following through with it. I know the best way to teach kids is to lead by example, so this is what holds me accountable everyday throughout my journey. 3) Why did you pick this genre and how did you come to be a children’s picture book author? Georgie and the Ants in the Pants evolved out of my children’s clothing line, Ants in the Pants! Prior to this, I worked for another children’s company, and I always loved writing and poetry. I believe this is what I was meant to do… it just took some exploring of my creativity and whole lot of self discovery! 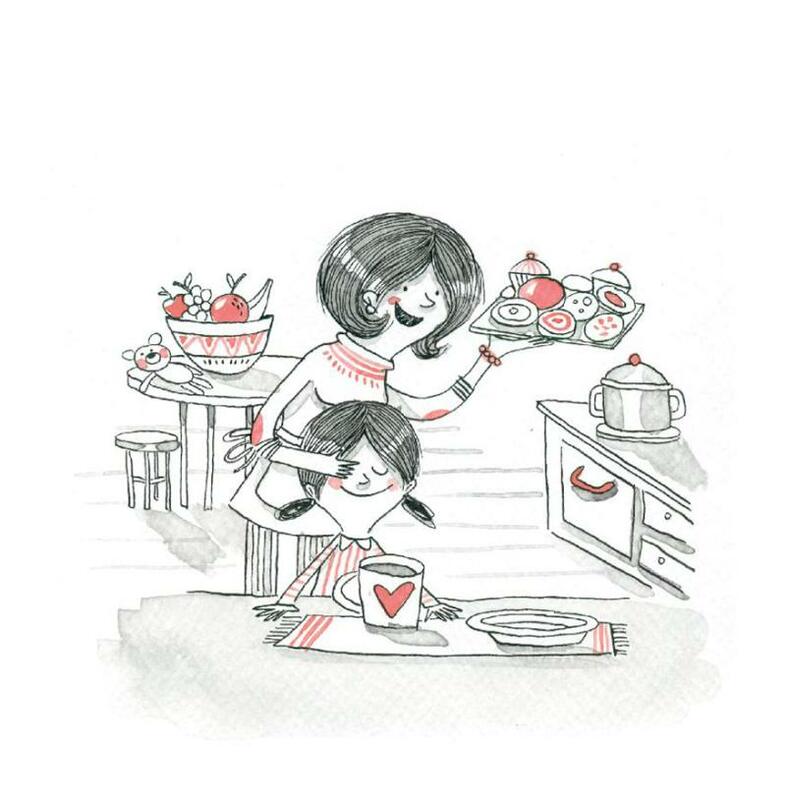 4) How do the illustrations complement your book? What was important to you as an author? I trusted my illustrator completely. I had known and admired Leigh Ann for years as an artist. I gave her the manuscript and told her to work her magic! My only request was that she create a character of a little girl to look like Sloane! That was very important to me! She did an amazing job! 5) Tell us about your school visits and why do you love doing them? 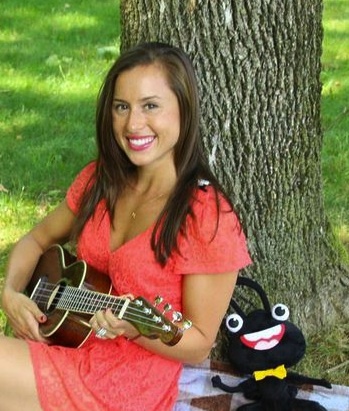 Do you ever go anywhere without your ukulele? Oh my goodness- I could write a novel here! I absolutely LOVE doing school visits! This is another example of how my business has evolved in a way I never would have expected. I love doing them because I get to see the impact I am capable of making first hand. The children are so cute, and they fill me up with so much fuel to keep going and reaching for the stars. I visit to inspire them, but the truth is that they are inspiring me! The BEST is when I whip out the ukulele and get to watch them dance their hearts out! My ukulele is with me during every author visit or event! I play and practice almost every day. I never sang or played an instrument before I wrote the book. Then, a theme song came to me, and I just had to follow through with that too. 6) What is the most fulfilling thing about being an author? The most fulfilling thing is the fact that I made something that will apart of a child’s life forever. 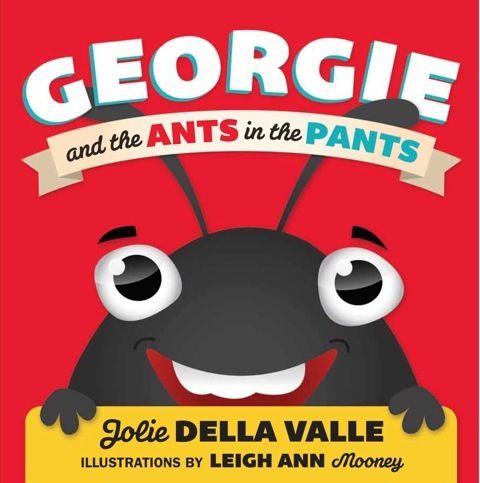 Many people have told me that Georgie and the Ants in the Pants is a story time favorite ! A person never forgets their favorite books from their childhood. Children’s books eventually become a reflection of so many special and cherished memories! It also makes me so happy to think that one day my great, great grandchildren will be able to read a book that their great, great, Grandmother wrote! 7) What do you hope children will take away with them after reading your book? I hope it makes their day brighter. I hope they feel encouraged to do the dance moves, and be silly, and have fun! I hope they are reminded of how special they are. 8) Tell us about your blog and what is it about? My blog is a space for me to share special “Ant” news, poetry, and anything else that I feel is inspiring and uplifting for others! 9) Do you have any advice for aspiring authors about chasing their dreams? Yes. Stop only thinking about it. Start being proactive. Take however many babysteps you need, but be sure to move forward a little bit everyday! Your future self will thank you so much! The place outside your comfort zone is magical. 10)What are you working on now? My head spins at times because I have so many exciting things I’m working on. Creativity surely breeds more creativity. I have to focus on one thing at a time though, otherwise I nothing will get accomplished! The main things I’m currently working on right now include more song writing, my second book, manufacturing a “Georgie” stuffed animal (everyone asks for it!! ), and expanding my reach by selling my book to Specialty gift and toy stores across the United States! Should you wish to know more about Jolie Della Valle and would like to purchase her book, here are all her pertinent details. Duck has decided to be a cat, and tries to show his good friend, Cat, that he’s just like her. He strives gamely to climb a tree, but when his best efforts fail him, his confidence begins to ebb. In an attempt to cheer him, Cat accidentally lands in deep water, where they both learn just how lucky they are that Duck is a duck. 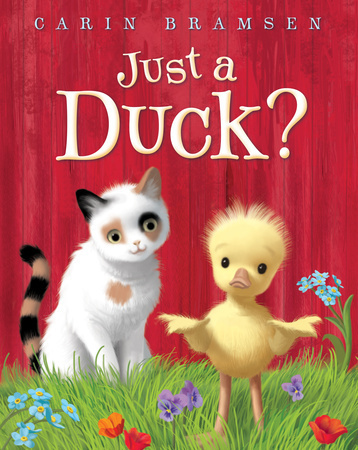 This book is a sequel to Hey, Duck!, told in rhyming dialogue. A mental image of Duck trying to slink like his friend, Cat, was the first spark for Just a Duck. I already had a strong sense of Duck’s character from my previous book, Hey, Duck!. He is wildly enthusiastic, inclined to silliness, but with some instinctive wisdom, too. I could imagine his giving his all to being a cat, and struggling to prove it when challenged. I sympathized, suspecting this new goal might not serve him well – and that’s when I thought there might be a story in it. 3) What do you hope children will take away with them after reading your book? I’d love to help kids understand there are many, many different ways to shine, all eminently worthwhile. 4) How did you come to write and illustrate and why did you pick this genre? My first picture book project was illustrating The Yellow Tutu, by my sister, Kirsten Bramsen. From then on, I was hooked on the possibilities and demands of the picture book form: the dance of words and images to tell a story, and the challenge of doing so in such a short space. 5) When you have an idea for a new book, what comes first? The words or the illustrations and what is your process of putting them together? So far, my books have all started with a nascent sense of a scenario and a feeling for the characters involved. That might come to me with some words or an image attached, but at first it’s more about the general dynamics and where they might lead. From there, words, images and plot ideas arrive, higgledy-piggledy – during a walk or shower or some household chore. I usually jot or sketch whatever pops up, knowing the selection and sorting will come later. At some point early on, I set up sixteen two-page spread templates in Photoshop. This will become my working dummy: the sketched version of the book. I scan sketches in, alter or move them as the story evolves, or sketch directly into the computer with a digital stylus and tablet. I can type right on the Photoshop dummy page – that’s sometimes where I write and rewrite the story. Words and pictures continually change and inform each other as I develop the book. 6) As a child, what books and/or authors/illustrators influenced you the most and why? My first book love was Dr. Seuss. Oh, the places he drew! I felt he threw the world wide open with his wild spaces and infinite invention. I still want books to do that for me. The most fulfilling by far is hearing that a child enjoys my book, and feeling that maybe I’ve added a little happiness to someones life. I also relish the first stages of writing and sketching a book – that primal buzz when something new begins to take shape. 8) Describe your illustration style and when did you realise you could make a living from your talent? My published illustrations so far are brightly colored, with tangible-looking textures and volumes. Recently, I’ve been playing around with a more linear style. Regardless of style, I love most to show character through expressions and movement. As to the second half of the question, I’m still trying to figure that out. 9) What are you working on now? I’m now working on the third Duck and Cat book for Random House, as well as some other seedling projects. TH ANK YOU FOR LETTING US GETTING TO KNOW YOU! Should you wish to know more about Carin Bramsen and would like to purchase her book, here are all her pertinent details. Award-wining author of children’s picture books A Brand New Day: about divorce and Wishful Wedding: about LGBT equality and same gender families. Creator of Pigeonhole Books and blogs about self-publishing, writing, online book marketing, peer bloggers and illustrators. 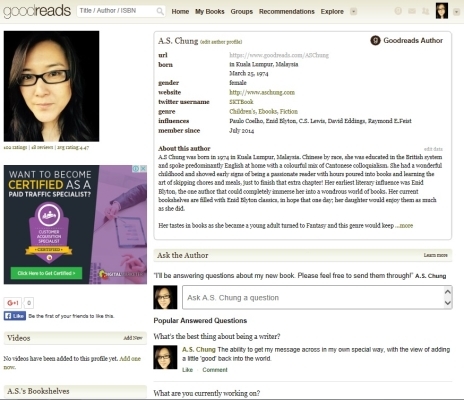 As an author, I am sure you have joined Goodreads as part of your online marketing strategy. Known as the Facebook for book lovers, it is an extremely large digital library that every author should be a part of. Now that you have navigated your way through the website, please venture your way to the bottom of the page and click on Author Program. If you haven’t already set this up, please take some time to do so. As it is a site which is dedicated to all things books, it is an invaluable tool to take advantage of it. It is completely free so you have absolutely no excuse! It is important because under all the books listed on Goodreads, there is an option to click on the name of the author to find out more about you. You need to make sure you give them a dynamic snapshot of you so that curious readers can get to know you. 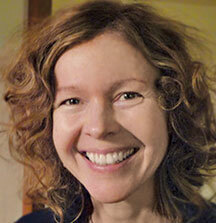 Create a profile by adding a photo of yourself that best reflects you as an author. I suggest a fairly professional looking image and not one that is cropped from a family photo. Write a compelling bio about yourself. Only limited by your imagination! This feature enables you to share with your fans what you are currently reading. Makes for a good conversation piece. This feature also allows you to list your favourite books. Avid readers can form opinions about your personality just by the books you read. You can advertise any upcoming events such as book launches, readings or book signings. You can share a small excerpt of your book to entice readers. If you maintain a blog, you can add it to your profile for greater exposure. All posts on your blog will automatically be uploaded on your profile so no additional work required. 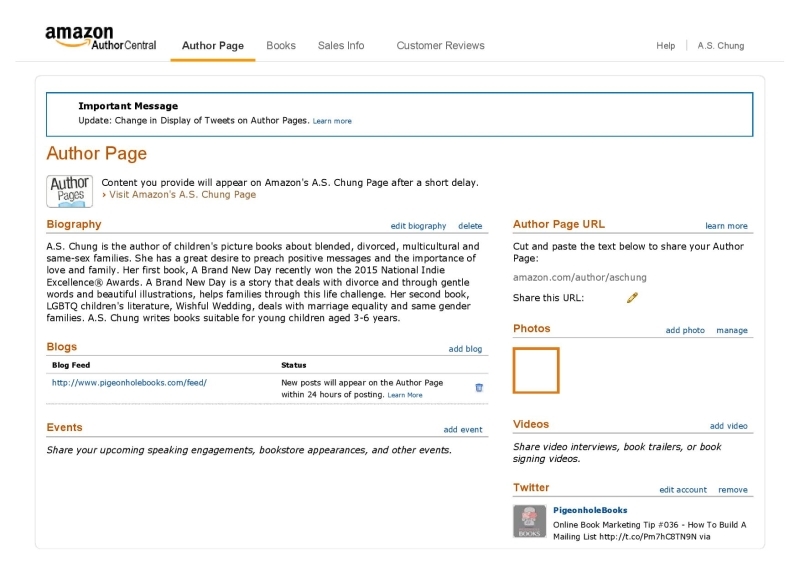 You can add the Goodreads Author Widget to your website or blog to showcase all your hard earned reviews. Promote your books by participating in discussions that may be relevant to the book genre or topic. There is no harm in joining this program. According to Goodreads, they are the world’s largest site for book readers and book recommendations. With over 20 million users and now acquired by Amazon, it is a truly useful site to be a part of. Stephan was born in Düsseldorf, Germany, where he studied visual communications at the University of Applied Sciences. 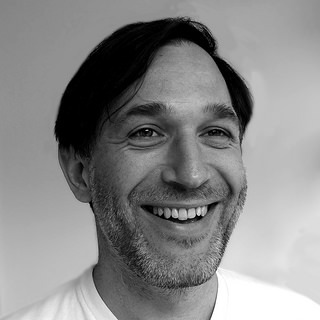 Stephan has been drawing for print and web agencies, publishing houses and event marketing companies since 1996 and is very fond of the diversity of his profession. Stephan published his first children’s book in 2011 which became the starting point for his new found passion, to write and draw his own stories. 1) How did you become an illustrator of children’s books after having a professional career drawing for print and web agencies, publishing houses and event marketing companies? Wimmelbücher are picture books with crowded scenes and are very popular in Germany. I was very fascinated with them at a very young age and the images of artists like Ali Mitgutsch are branded in my mind. Comparable to these books outside of Germany are probably only the Where is Waldo? books. I saw that a befriended illustrator published a wimmelbuch at a brand new publisher which was specialized on these books. So I wrote a quick email to the publisher and got a chance to do a 4 spread book. It became a success and 2 other books followed. These books gained the attention of a UK Agent and after signing up with them I got the chance to do 3 more books for the UK market. The books took over my work time until I basically do only books now. It’s hard to describe what you do subconsciously. I would say it’s colorful, bright, joyful and a bit edgy. The form of the characters are stylized and abstracted. I try to mix my influences of 50s and 60s flat shape illustrations with my personal twist. 3) Has technology changed your trade and the way you work? My pencil drawing are very different to my digital art. I could not do my digital style analogously. My work is much more clean and crisper, which I try to break up again and make it look more handmade lately. 4) Who are your biggest influences in your artistic career and why? This changes through the years. It used to be Comic Books from Europe as well as the US, artists like Möbius and Frank Miller, then Chris Ware and now it’s old school children’s books from Alain Gree as well as contemporary artists like Marc Boutavant. 5) When did you realise you could make a living from your talent? This was always my intention to live from my talent, so I took every job I could find, even during my studies. And that includes everything in Graphic Design, Webdesign and Programming. It is key to talk to the client via telephone or in person. Only that way you can fully understand what they want. A lot of things can be misunderstood if you only communicate via email. There is one image of a walking tree and a small boy walking through a dark forest. The illustration was done pretty quickly and without much thinking, but the reaction was huge, because everybody can see a story in there. I am currently working on it and hopefully this will be a book one day. 8) What advice do you have for aspiring illustrators when first dealing with a publishing house? If they have a script for you ask yourself if you really like it and if you really want to tell the story through pictures. If you have your own story, they will try to tweak it here and there. This can be a good thing and it can improve your work. But always ask yourself, is it still fun to draw and is it still your story at heart. Lastly take a close look at the contract. Do you get enough out of this? And do not work without getting royalties, because that’s your real payment in the long term. 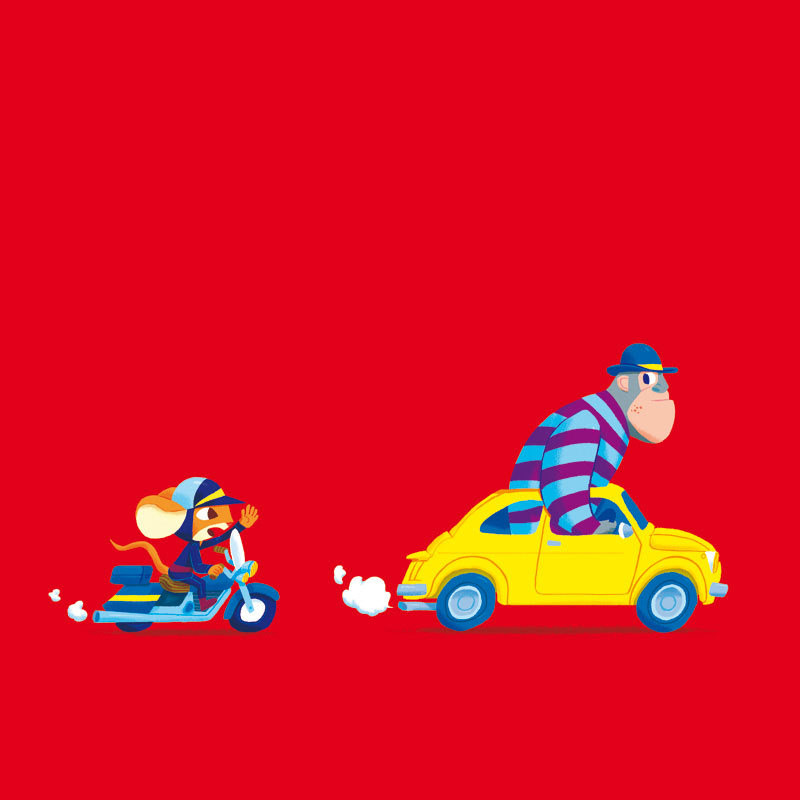 Follow That Car – the mouse following the gorilla on a big red background is a eye-catching image I am really proud of. 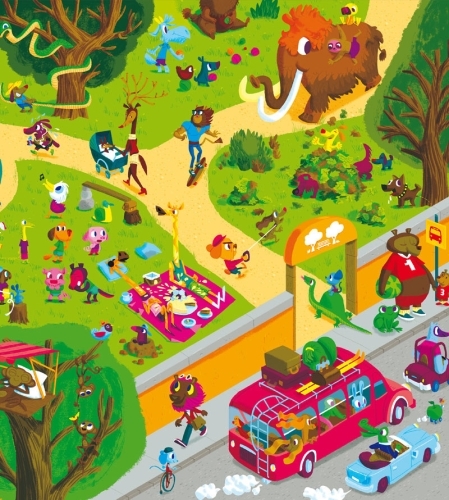 Find The Frog – the park scene is a lot more colorful than my work before. 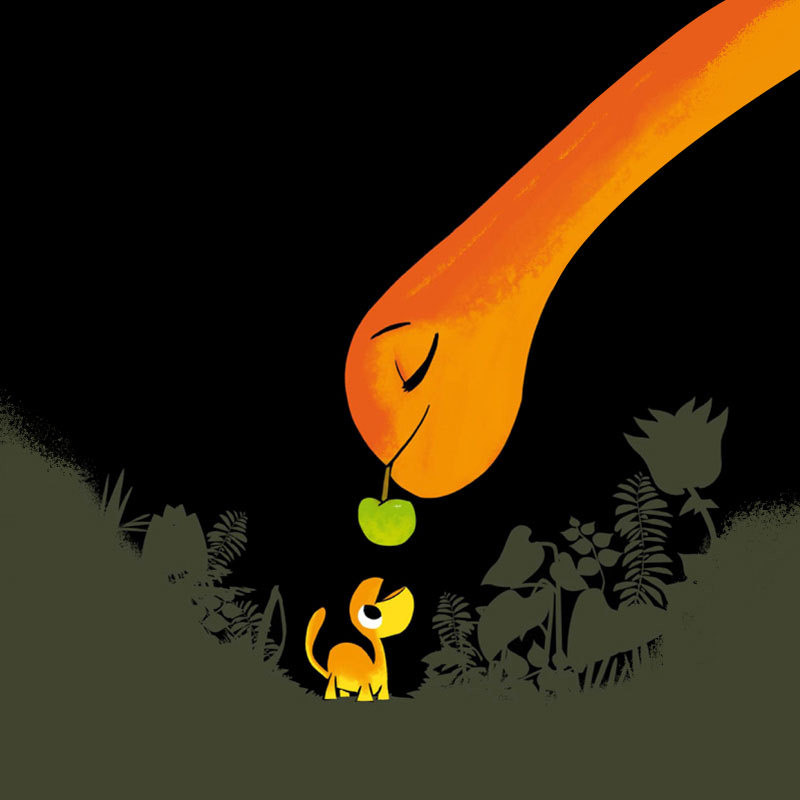 Mamasaurus – this image was done just as a quick scribble and gained enough attention from a publisher so that I did a whole picture book around it. Should you wish to know more about Stephan, here are his pertinent details. Charlie is a mouse who lives in a small town and works at the local diner. One day, a creature comes in for a cup of coffee. Needless to say, the regular customers aren’t quite sure what to make of him. But Charlie, being the service professional that he is, tries to make the creature feel at home. The creature explains that he is on his way to see the world and can’t stay long. This comment sets Charlie’s imagination spinning and inspires him to seek out an adventure of his own. I was inspired by the day-to-day life in a small-town diner and the pleasure that comes from being part of such a community. To the diner patrons, Charlie is more than just a waiter. He is someone they count on seeing and speaking to every day. When the creature enters the diner, he throws off the town’s homeostasis: “They weren’t used to outsiders in town. No one ever did much coming or going.” Rather than shutting the creature out, I decided to have Charlie (and the other diner regulars) make the more interesting choice to invite the creature into their lives, to experience the initial discomfort of the unknown, and then to reap the benefits of being open to new people and new ideas. 3) How did you come up with the title or series of your book? 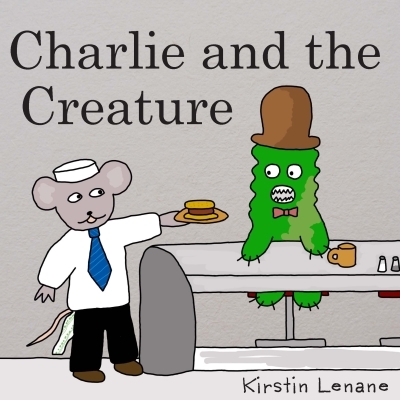 The title comes from the encounter between the two main characters, Charlie and the creature. This encounter sets the story in motion. 4) Why did you pick this genre? I used to write short stories for adult readers, but found that I had a lot more fun when I started adding pictures. Combining drawings with writing seems to place me in a more natural place as a writer. The drawings help the writing flow and vice versa. At this time, I’m a little less clear about how to market an illustrated picture book for “all ages,” so I’ve been trying to write more for children, where there is a clear market. I have a two-year-old son and I work as a counselor at two elementary schools, so this helps me get out of my adult head and into the world of children, but this is not always easy. I think I am still learning who my audience is and how to write for them. 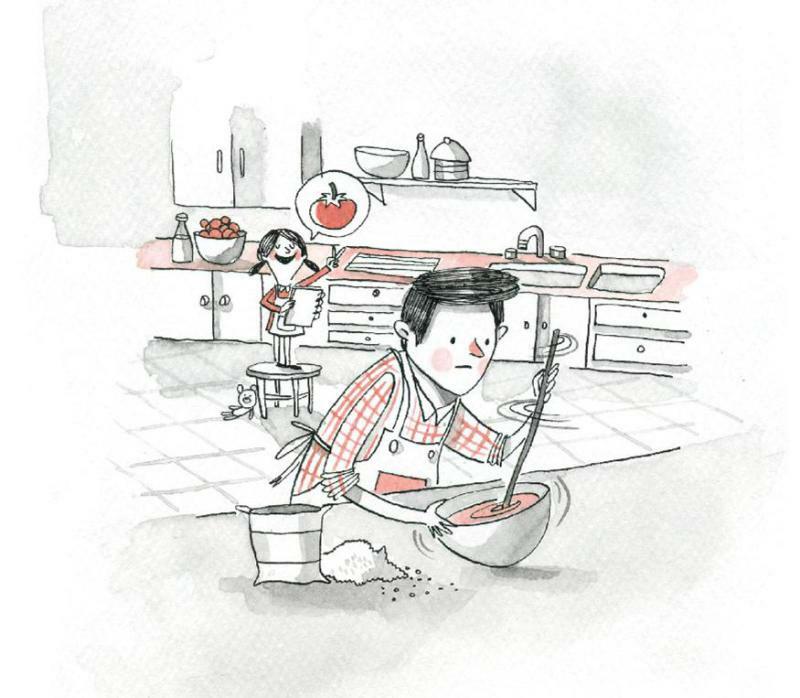 5) How do the illustrations complement your book? What was important to you as an author? When I am creating a story, I begin by drawing pictures. Because I am not a professionally trained illustrator by any means, the drawings often come out looking a little funny. For example, a hat on a mouse’s head might end up looking more like a pancake. Why is there a pancake on his head? And so it begins…. If I had my way, I would draw with pencils and markers, and create books using paper, cardboard and glue. However, in today’s “modern age,” I’ve also enjoyed the capacity to reach readers by creating books that can be digital. 6) As a child, what books and/or authors influenced you the most and why? As a child, I enjoyed books that didn’t treat me like a child, but as a person. Some of my favorites included, the Frog and Toad books, The Velveteen Rabbit, the Frances books, George and Martha, books by William Steig and Tomi Ungerer. By putting my human questions into the world of a mouse who lives in a made-up place in the world of a book, I am able to grapple with some serious, difficult things, in a manner that feels less heavy, but is liberating at the same time. Being an author helps me to take life less seriously, and more seriously at the same time. It’s a way of creating meaning. 8) What do you hope children will take away with them after reading your book? Fear can make us very resistant to trying new things or considering new ideas, especially if we seemed to be doing just fine before these new ideas walked into our lives. One of the messages of this book is that it is much more fulfilling to keep learning and to keep growing than it is to try to keep everything the same. 9) Who is/are your favourite author/s as an adult and why? My favourite book is To The Lighthouse by Virginia Woolf. There is beauty and joy in her characters, but there is also this sense that everyone is alone, as she moves through a scene and through each character’s private thoughts. She captures people’s moments of connection to each other, as well as their inability to truly connect and relate. I am writing a children’s book about a character who is obsessed with time and keeping lists. Fortunately, there are three pesky rabbits who live outside and teach him a thing or two about stopping to enjoy the moment. Should you wish to know more about Kirstin Lenane and would like to purchase her book, here are all her pertinent details. Famous archaeologists, the Jaspers, DemiChat and Lord Flannery Beagle’s owners, after their amazing discoveries in Egypt (Book 2 in the Series, DemiChat and the Lost Mummy) are invited on an international Academic Tour to lecture about their findings. While in Peru they meet Carlos who persuades them to visit Machu Picchu and trek into the Amazon Jungle to search for the Incan City of Gold – he leads them into danger!. The city, under the protection of a native tribe and a wily jaguar, evades them until Amazonian Warriors show them a hidden passage through a volcano. I was inspired to write the series by my love of Sherlock Holmes, my Himalayan cat, Jade, and my niece’s beagle, Shiloh. I love animals and thought it would be fun to write a spoof about a cat-and-dog team playing the immortal Sherlock and Doctor Watson. I commenced the series with the intention of a trilogy: the first set in Europe, the second in Egypt and actually had 2 plans for the third book. With the help of Teacher-Librarian friends we surveyed children who had read the first two books and asked them if they preferred a sequel set in the Amazon Jungle or New York. The resounding reply was in favour of the Amazon and Incans and Warriors – hence, DemiChat and the City of Gold was written. 3) How do the illustrations complement your book? What was important to you as an author? My digital illustrator is Cheryl De Los Reyes Cruz, an American digital artist who understands the importance of colour and dash and action for an ebook for the age group. I think Cheryl has done an amazing job and extends the story through her brilliant work. 4) As a child, what books and/or authors influenced you the most and why? Fantasy authors, Ursula Kroeber Le Guin, particularly the first four Earthsea books and J.R.R.Tolkien. Why? Their books made my imagination soar and gave me hope that in the constant struggle between good and evil that good will win out. 5) What is the most fulfilling thing about being an author? 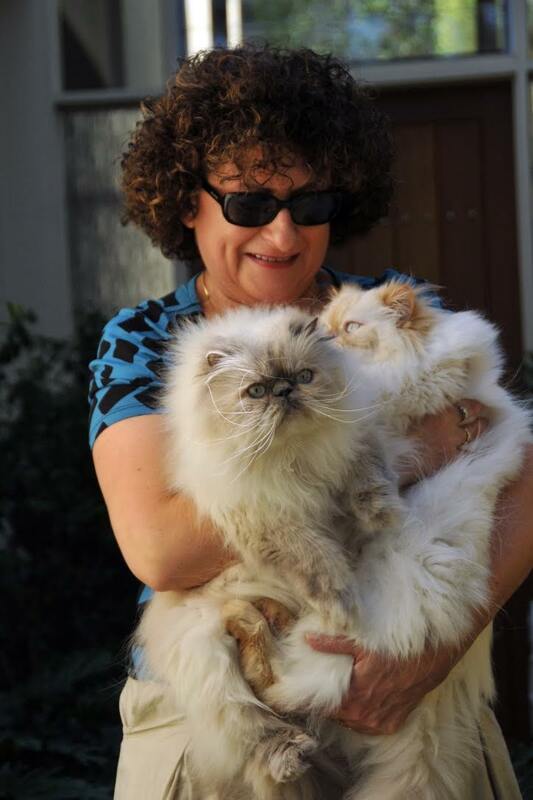 Being totally absorbed in my passion for writing and knowing that my readers are transported to places and meet characters that they may not experience otherwise as they see the world of my books from my unique perspective. 6) What’s the greatest compliment you ever received from a reader? 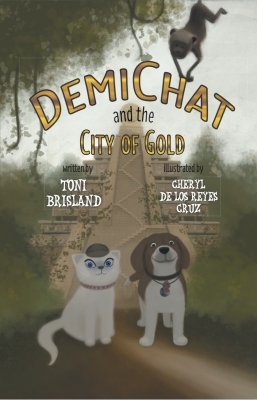 From a father of a reader … “your DemiChat book was the first book my 10-year old son ever finished”. A love of animals, of adventure, a belief that anything is possible and that you can create your own destiny. 8) Who is/are your favourite author/s as an adult and why? My favourite authors are adult authors: Joseph Conrad, D.H. Lawrence, Hermann Hesse, Kathryn Heyman, Richard Flanagan. Why? Apart from being wonderful storytellers, their imagery is rich and detailed, they are structural experts and they force me to think about the bigger issues in life. 9) How would you define ‘success’ as a writer? Writing a piece of work that is the best a writer can do (no matter how many edits need to be done and how long it takes to write it), says everything you want to say and is written as if it is the last thing you might write. I’m writing a novel for adults. Should you wish to know more about Toni Brisland and would like to purchase her book, here are all her pertinent details. A Brand New Day, children’s picture book about divorce receives a beautiful review from The Picture Book Review! 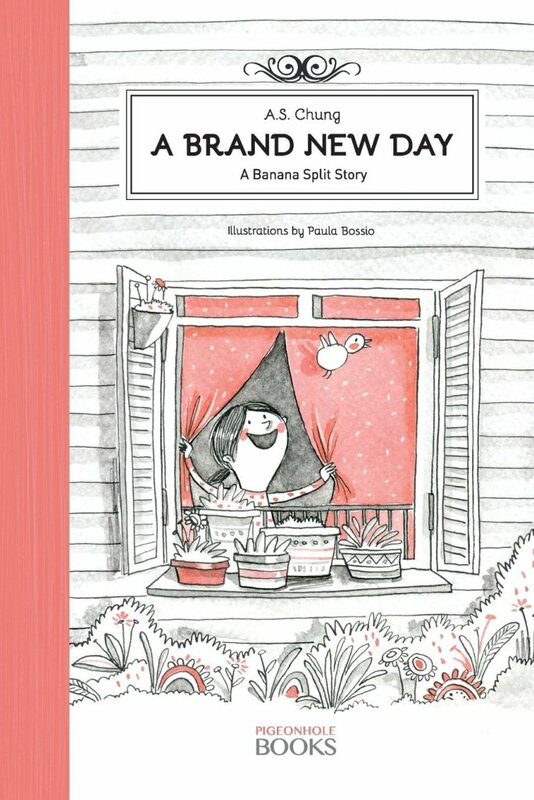 A Brand New Day is an uplifting and beautifully illustrated story about a little girl’s life with her parents after the divorce. It does a marvelous job of reminding us all that a parent’s marital status has nothing to do with how much they love their children. A little girl tells us, in verse, about what her life is like on the alternating days that she spends with her mother and father. From A Brand New Day. Images Courtesy of A.S. Chung. Well done! You have managed to list your book on Amazon and it is now available for sale. It would seem that for most self-published authors, this is the first port of call and it always brings about such a great sense of achievement when you finally see your book listed and is available all around the world. Now, have you set up your author page? 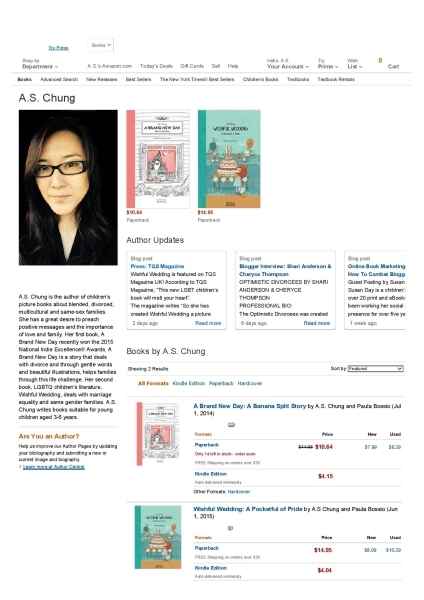 The Amazon Author Central page enables readers to get to know you as an author. This small engagement brings some life to the book and can often encourage the reader to buy your book if they identify with you and your story. Amazon is a jungle. With more and more books being self-published on a daily basis, it is imperative to take advantage of any medium which may assist with increasing exposure. Taking full control of your Amazon profile helps to define you and your books in exactly the manner you wish to. You are also able to add more books to the list as you continue to launch new titles. Having a well-managed author profile will aid in keyword searches on the website and improve your Amazon and Google SEO. Amazon Author Central provides free book tracking in terms of weekly sales, sales rank and author rank. This could certainly help you with your Amazon book marketing strategies if you understand when and where your books are being sold. You are able to interface your blog postings and Twitter feeds onto the profile page so it is always showcasing your most up to date postings. Readers do enjoy seeing that the author is active in the social media world and any subsequent follows increases the author’s presence. This in turn leads to greater web presence and assists with search engine tools. Author forums and discussions are also another free function of the program. This allows the author to interact with readers personally and is an invaluable capability. All Amazon customer reviews for all your books may be found in one place and thus easily accessible. The setup of the author page is a highly user-friendly process. Follow these steps for how to set up your profile page. Sign up for Amazon Author Central. Click on “edit biography” to add a biography of no more than 100 words. Amazon provides you with an example of a good biography. Click on “add a blog” if you have one so that the reader can see your real time updates. Click on “add event” to share your upcoming speaking engagements, bookstore appearances, and other events. 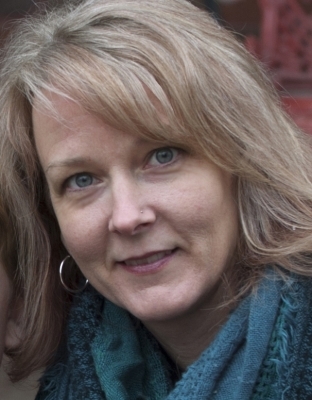 Add up to 8 photos that will help to enhance your author profile. Add any relevant videos of interviews, book trailers, or book signings. Add Twitter account so your feed is included in your profile. Click on “add book” to create your bibliography. 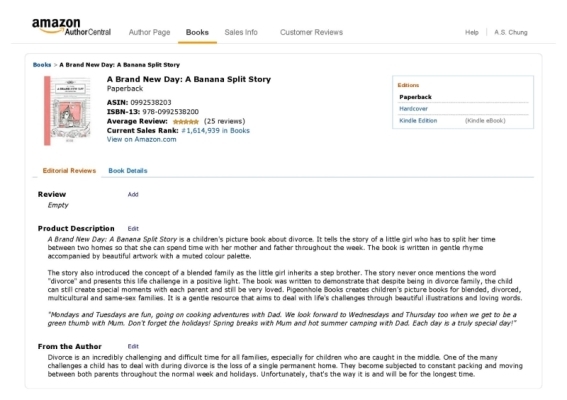 Search by title, author or ISBN. a. Reviews should be from reputable sources and the source should be credited after the quotation. b. Quotes from outside reviews should follow “fair use” copyright guidelines. c. Limit of 1-2 sentence. d. Up to 600 characters. a. An objective summary of the book subject matter and genre. b. Up to 4000 characters. Add something from the author. a. A message from you about this book – what was your experience writing it, why did you write this book and how does it relate to other books you’ve written? b. Up to 8000 characters. Add something from the inside flap. a. Content inside your book’s flap should be transcribed without any changes. Add something from the back cover. Write something about the author. a. This section should be the same or similar to your biography as it would appear in a book. b. Up to 2000 characters. Make sure this information is copied across all available editions i.e. eBook, paperback and/or hardcover. And that is it! Important to update your profile over time as you change and evolve. Reminder that if you have books on amazon.uk, it is not an automatic update on that site; you would have to login and create a profile specifically for that site. If you are able to get your profile translated, you should also update your author central page for other large international Amazon sites such as France, Germany and Japan.